1. I won third place for "Rhythm Army" in the preteen line division of the 2005 St. Charles Missouri results. 2. I wrote a fantastic testimonial about the superior yoga teacher training I received from the Salt Spring Centre of Yoga. That must mean I'm also now a yoga teacher. Click here to read it. 3. I am one of the "Beautiful People of Town Hall." Click here to find my picture. 4. I am the news editor at Genesis, a magazine at Elkhart Memorial High School which has apparently garnered some controversy after printing an article about Valentine's Day for lesbian couples and an opinion piece calling for the legalization of marijuana. 5. I am the contact person to call when ordering the 18th edition of the bookContraceptive Technology from the website www.sexualetiquette101.com. 6. I am a staff writer for Purdue's newspaper, The Exponent. 7. I am one of 700,000 people connected with European royalty. 8. I enjoyed the recent field season in the high Andes of Chile, thanks to the Mineral Deposit Research Unit. 9. I am an 8th-grader in the Challenge Program at Millstadt Consolidated School, which prompted me to present my findings on a local one-room school house at the Millstadt Historical Society meeting. 10. I was an amateur competitor in the Atlanta Open, a ballroom dancing competition. Ha!! Unfortunately, I don't appear to have won anything. Big surprise. I have NOT, according to Google, ever created this blog, although my name shows up as being in one of Lori's blogs. Go figure. How'd ya do that, Lori? There are a few true things about me on Google, but I find the untrue ones to be much more fun. I encourage all of you to Google yourself, and find out who you might have been. Here's a random photo (a for real one, not a googled one!) of my bro and me. I got my underwater camera film developed (finally) from the cruise a few weeks ago. 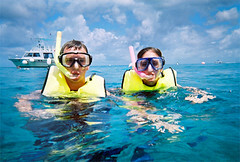 This is us snorkling in the crystal clear waters off the coast of Cozumel. I Googled myself just a few days ago, and my blog didn't come up. But I'm pretty sure there are only two Lori Bredemeyers in the world (yes, there is another one of us), so most of the things about me are true. Ohhh Wow! look at that water on your cruise! My family went on a cruise to Alaska last summer. I had such a great time. Our water wasn't like that though. It was ice cold.